The fracture toughness values of the five intermetallic compounds in the Fe–Zn system have been investigated through bend testing of chevron-notched single-crystal microbeams. The intermetallic compounds of the Fe-lean phases, δ1p and ζ, exhibit fracture toughness values higher than the other compounds of the Fe-rich phases, Γ, Γ1, and δ1k. The δ1p-phase compound exhibits a strong anisotropy in fracture toughness while the other four compounds exhibit almost no anisotropy. The compositional dependence of fracture toughness is discussed in terms of the surface energies estimated by ab initio calculations as well as the capability of stress relaxation around a crack by dislocation emission. The Γ phase with a relatively wide solid solubility range exhibits no compositional dependence of the fracture toughness. 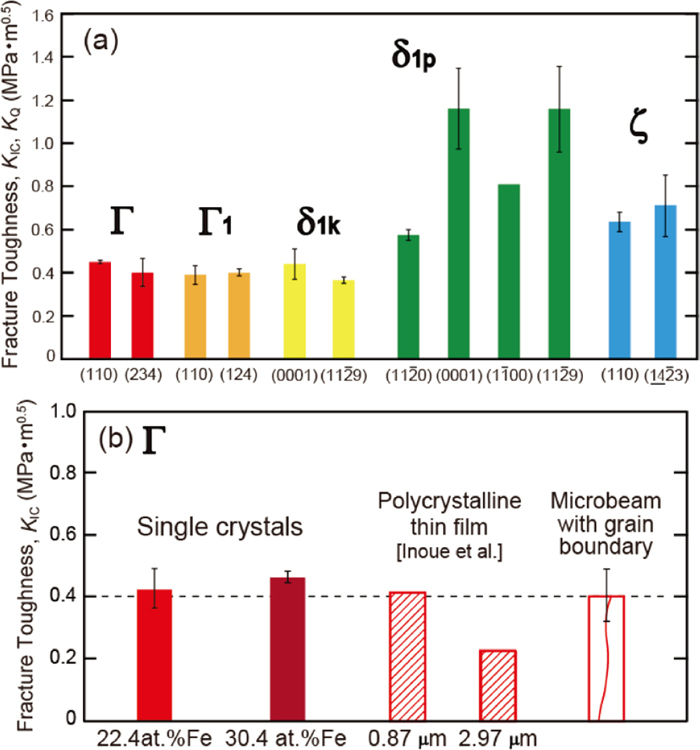 The fracture toughness value of Γ-phase microbeams that include a grain boundary at the chevron-notch position is comparable to that of the Γ-phase single-crystal microbeams, indicating that the grain boundaries in the Γ phase may not be particularly weak.